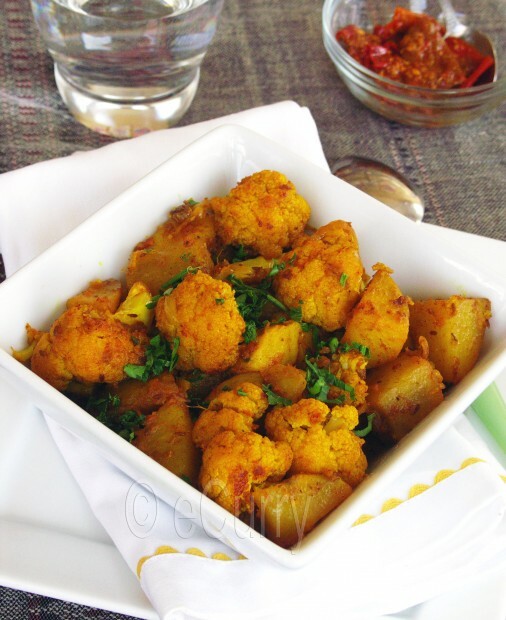 Aloo (Potato) and Gobi (Cauliflower): Aloo and Gobi are cooked with myriad of spices. A staple in most Indian restaurants, the name “Aloo gobi” generally refers to this aromatic combination of cauliflower and potato usually cooked in the Northern parts of India, esp. in Punjab. This ever popular dry vegetarian curry has been brought to worldwide fame in Gurindar Chaddha’s Bend it Like Beckham. If you haven’t seen the movie, you have got to see it; no not because of its association with “Aloo Gobi” . Although the term “Aloo Gobi” typically refers to the Punjabi recipe, the combination of potatoes and cauliflower are cooked all over India; the same dish can differ in cooking process, the spices used and obviously the taste depending on the part of India it comes from. 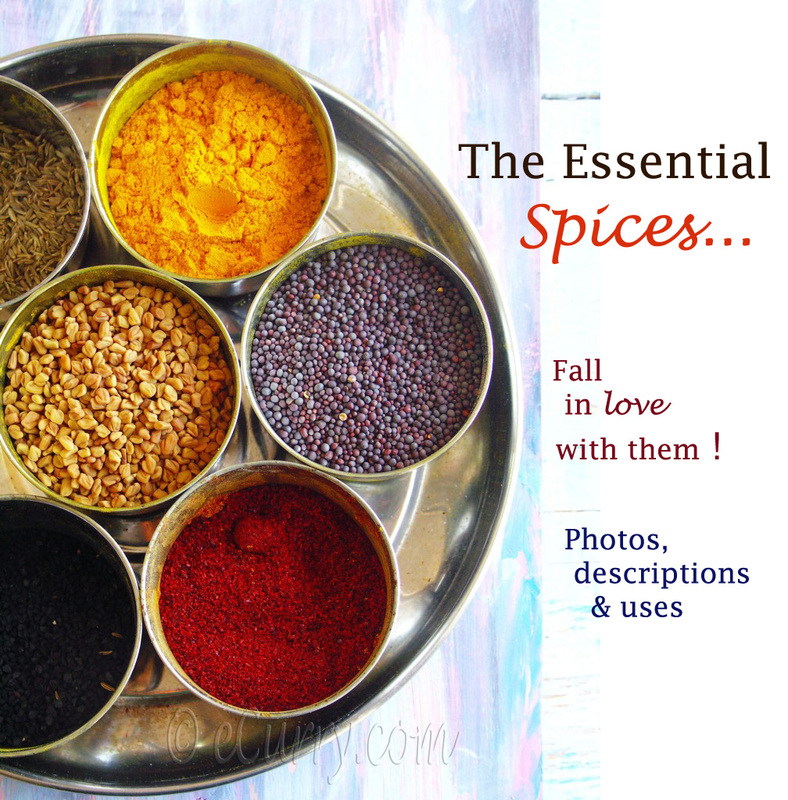 In Bengal, it is a much lighter dish cooked with less spices, in Southern India mustard seeds and curry leaves may be used instead of the spices that have been used here. Here is another variation of cauliflower and potatoes that I had posted quite some time back; Cauliflower and Potatoes in Cream Sauce. I am not claiming here that is the the exact way the Aloo Gobi is done in Punjab; but this one tastes darn good and a big favorite in our family. 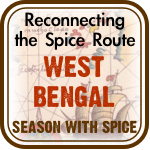 The spices and ingredients here are the same as used in the northern region of India. I have however adapted the procedure to what works best for me. I have sauteed the potatoes and cauliflowers once before I have actually cooked along with the spices. You can skip this if you feel that you are in no mood for a long process. Wash and drain the cauliflower florets. Sprinkle 1/2 teaspoon turmeric and salt on the florets and give them a good shake so the turmeric and salt roughly coats them. Wash and drain the potatoes. Sprinkle 1/2 teaspoon turmeric and salt on them and give them a good shake so the turmeric and salt roughly coats them. Take 1/4 cup of oil and pour about half of it in a thick bottomed pan. Heat the oil and saute the cauliflower florets in the oil at medium heat for about 5-7 minutes, while tossing frequently, till there are light brown spots on some of the florets. Remove with a slotted spoon and set aside. Heat the rest of the oil (the other half of the 1/4 cup) in the same pan. Saute the potatoes the same way you did the cauliflower. Remove and set aside. Heat the rest of the oil (the 1/4 Cup). 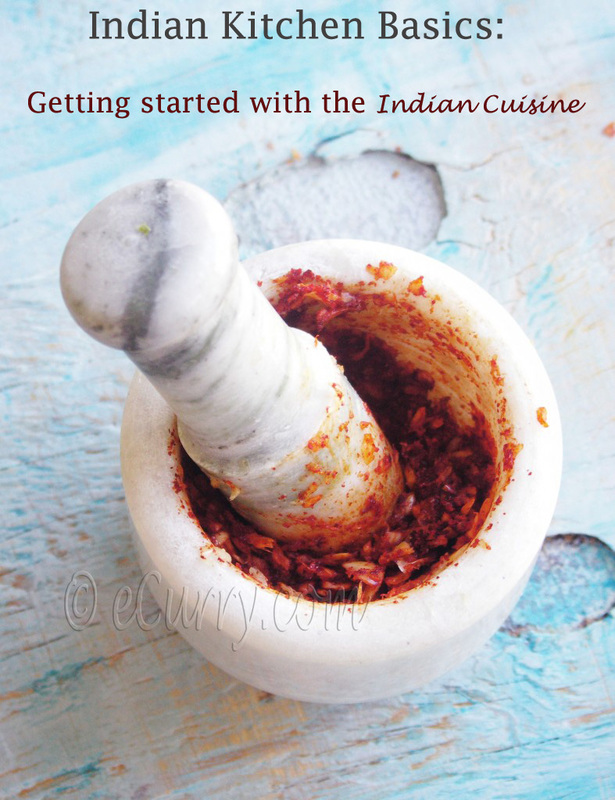 Add the cinnamon, cloves and cardamom; when a sizzle and get fragrant add the cumin seeds. When the seeds sizzle add the onion slices and fry at medium heat till they are clear and soft. Add the ginger,peppers and the tomatoes and fry for about 2-3 minutes everything gets mushy and soft. Add the turmeric, salt and the coriander powder and fry some more for about a minute or two; you will see the oil separate on the sides and entire mix will slightly bubble. Add the pre sauteed potatoes to the pan and toss well along with all the cooked ingredient mix to combine well. Cover and cook at low to medium till the potatoes are about half cooked. Now add ll the florets of the cauliflower to the pan and toss well; all the pieces should be well coated with the mix. Add 1/2 cup warm water to the pan and cover; cook at low to medium heat till the cauliflower florets and the potatoes are fork tender. Check to see that they do not get mushy. Once they are fork tender, uncover, increase the heat and cook at high heat till there are almost no liquid left in pan. This is kind of dry dish and whatever spice mix remain will just coat the potatoes and florets; there should no liquid sauce left in the pan. Garnish with fresh chopped cilantro and serve with naan, paratha or any Indian flat bread. We had some Indian red chilli pickle and yogurt on the side along with some parathas. Both my girls are big suckers for cauliflowers and this happens to be one of their favorite dish. They sniff around the house when I am making Aloo Gobi and cannot wait to sit down and start their meals. A well done dish from home land – a well deserved comfort food! 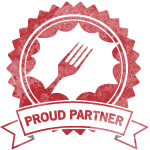 January 21st, 2010 | Category: Dry Fries, Sides & etc. Gorgeous color and I like the Cauliflower intact without breaking down to mashed mass. Good one. That is gorgeous. I had a recipe for this I almost tried last week. I’m so glad I didn’t because now this is going to be the one I try. My daughter loves cauliflower too. Looks lovely. I somehow cannot get them right. The cauliflower we get here tend to become soggy unlike the ones in India. Any tips??? Yours look perfect. If you add water to cook the cauliflower add only very little; it is capable of cooking in the steam if you cover the pan and also the moisture from the masala. Uncover the pan before the cauliflower gets soft. if you see that they are soft on the top and still kind of stiff at the end, it is ok to uncover. Cook uncovered at high heat there after. it will be tender but not mushy after done. The pre sauteeing helps a little bit too. It absorbs less moisture as it has already absorbed the oil. And as the general rule, the more oil you use the better. See this recipe: Cauliflower with Nigella – Bengali way . This one uses minimum oil, but works out just fine to keep them whole. Lastly DO NOT stir them, or toss them too much. Use a flat bottomed pan if you can, so all of it can be in a single layer. Everyone has their own way to cook this combo! Perfect side dish! Soma, I think I will have to dare to make this and stop just drooling over all wonderful Indian food you make! That looks mighty good! A great combo! Beautiful recipe. The spice mixture looks really interesting. One of the most loved dish ever!! This is a scrumptious veggie dish, I love the spices, esp. the green cardamom! This is a favorite at our house too. But no tomatoes in mine. This look so darn tasty. thats a lovely curry Soma. 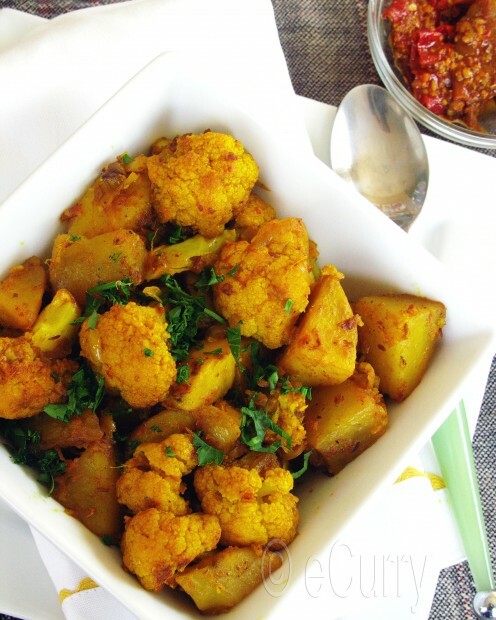 Alu gobi is a real comfort food and its so versatile you can have it with anything. your curry always comes out so vibrantly coloured…looks awesome. A perfect combination….and of course its famous all over India..yummy…beautiful clicks.. I am drooling. I love cauliflower but my children don’t like it so I don’t cook it. love how dry the dish turns out … I prefer dry sides for chapathis… and this one is perfect! Hey there… how have you been? I just love all your posts, they have me trying various dishes that I love or never tired before, the contrast in colors is just absolutely amazing. your curry looks so good! mine never comes out this great! gr8 color..love the no-fuzzy look of gobi..
this one is regular at our homel,,,ur version looks yum..
We love aloo gobhi too 🙂 Yours looks really yummy and spicy! 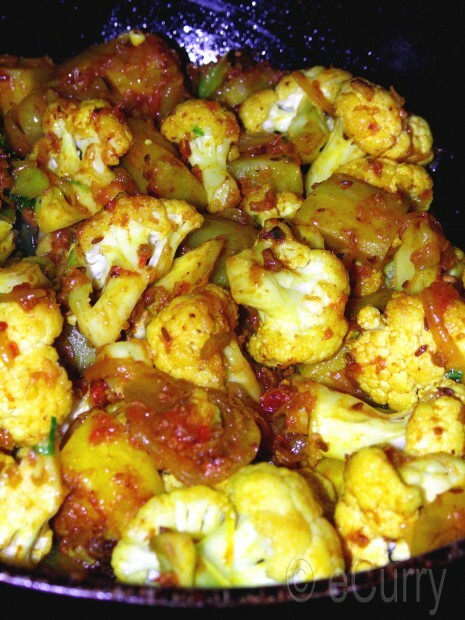 Our family loves aloo gobi,your is looking too good in colour! Must have tasted great with all those spices! 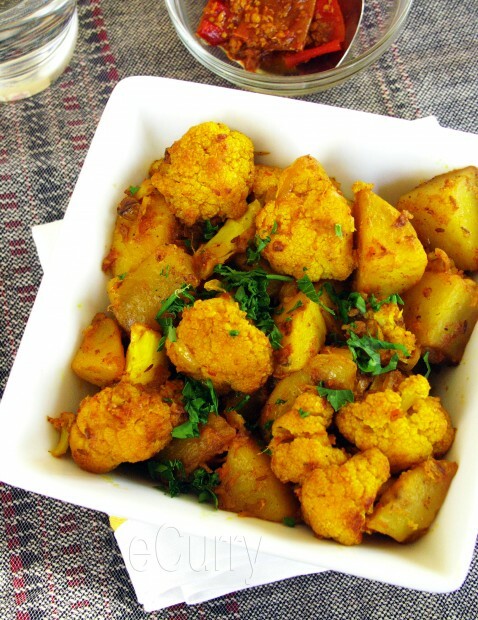 we all love aloo gobi in our family! Yours looks absolutely good and would have tasted great with all those spices!! Perefectly done……my daughter doesn’t eat it any other way….I add some garam masala also at the end…..
mmmmm they look gorgeous! I’ll have to make some soon. Thanks, Soma! Totally delicious! 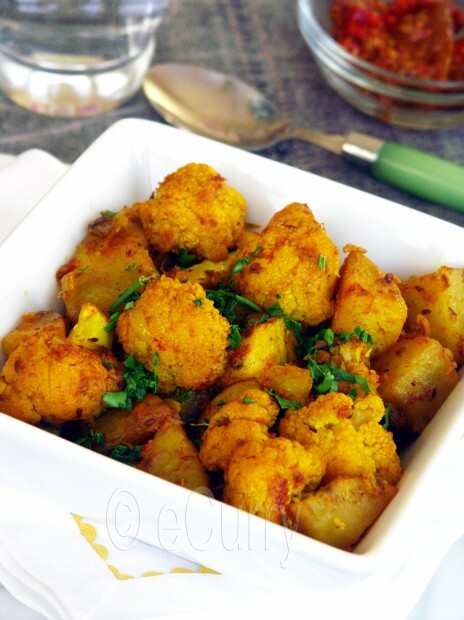 I love aloo gobi and yours is the best that I have seen. I would love to learn how to make Indian pickles of different types. 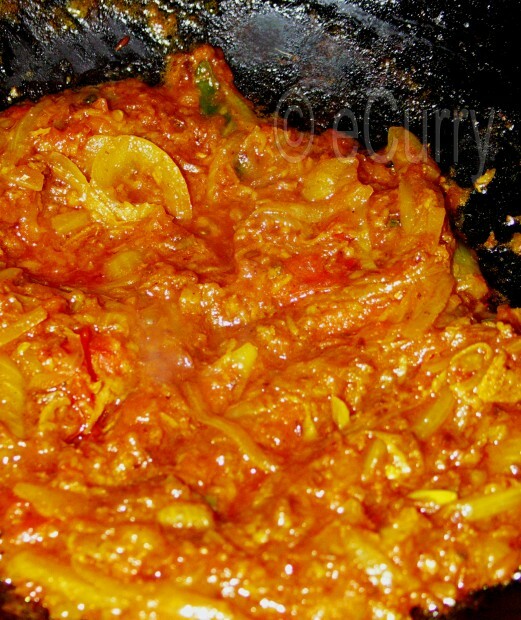 I am addicted to Patak’s but feel with the right recipe I could make them at home. Any suggestions? Thanks Natashya! Aloo Gobi is a very popularly used recipe in my home – but different ways. I have to admit that I have not ventured into making much pickles at home, esp. the store bought kind. the easy availability makes us go and just buy any kind we want. May be I should try to venture out and do some! here is one pickle I had made : Pickled Chilli Peppers This one does not taste anything like the store bought ones, but pretty good for a couple of days at home… short shelf life. It looks really delicious, Soma!I have cauliflower and potatoes and I will give this a try! Wow, this is one of my favorite Indian dishes. I just love all the aromatic spices. So delicious! I’m definitely going to make this. I’ve always wanted to do more with cauliflower. Looks mighty delicious. This is just beautiful, and I’ve been craving Indian food lately. I need to learn more dishes and cook them at home more often! yummy! this is one of my favorite dishes. 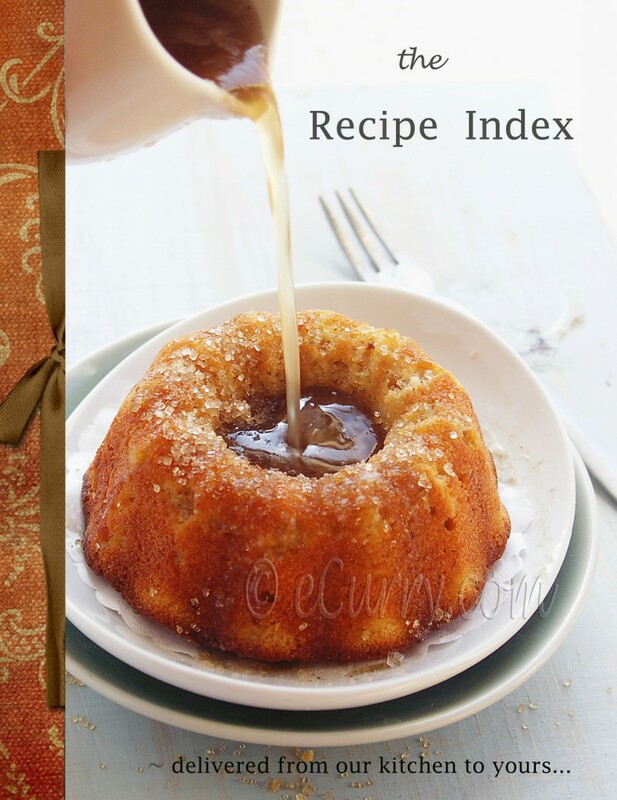 It is amazing how there are countless ways of making this classic comforting recipe. Loved the combination of spices like cardamon, cloves, cinnamon you have used. I have not used these for this curry will try the combination next time. Well, apparently I am part of the drooling sisterhood here. ; ) Looks fantastic! After reading your reply to Cilantro, I’m wondering if it can also be roasted in oven, or would that be considered an entirely different dish? If this would be cooked thru the entire process in the oven, I guess it would be different:-) unless it is really done towards the last part, after mixing all the spices…when the cauliflower & the potato need to get cooked & tender. I have never tried it, but thinking about it, it is worth a try. i tried it this afternoon n it was too good.. Thank you so much for giving it a try and glad to know that you liked it! Yesterday was the first time by mistake i came to your website and tried this recipe yesterday night and it came out exactly like the curry that we get from an indian restaurant. I followed this to the letter (something i rarely do) and was delightfully rewarded. It is so very different from other cauliflower and potato curries I have made. This is rather time consuming but well worth it. Congratulations on the recipe. Why doesn’t everyone NOT WASTE EVERYONE’S time by commenting on how a dish looks or sounds? Why don’t you just MAKE THE DISH and then write how it turned out? Geez people, get a life and just offer HELPFUL comments. We don’t care that you are “interested” in making it. We don’t care that you like the color or list of ingredients. Make the damn dish, or don’t, but don’t waste people’s time with stupid comments.